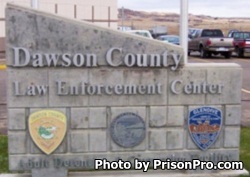 Dawson County Correctional Facility is located in Glendive Montana. It is a mixed custody prison that can house up to 144 male inmates. Selected inmates at this facility work jobs within the institution providing vital services in laundry, janitorial maintenance, and cafeteria work. Offenders are encouraged to take vocational classes and educational courses to earn a GED and learn a new skill while incarcerated. Inmates are allowed two contact visits per day with up to five people per visit. All visitors must be approved before they can attend a visiting session. Non-contact Visitation behind glass occurs on Tuesdays and Fridays from 9:30am-11:30am and from 1:30pm-4:30pm. Contact Visitation occurs on Wednesdays, Thursdays and Fridays at 9:30am-11:30am and from 1:30pm-4:30pm.